Want to donate to Mountain March but don't know anyone raising money? Feel free to donate directly to CAC here. 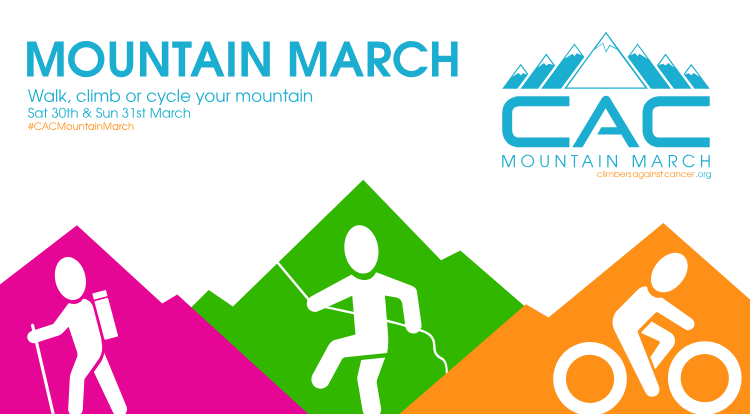 Welcome to CAC's Mountain March! We're inviting people to join forces with each other and climb, walk, cycle (or other!) up their chosen peak over the weekend of 30th and 31st March. What better way to celebrate Mother's Day! Teams can do this however they want - in the great outdoors or cover the equivalent distance at their local climbing centre or gym. There is no 'wrong' way to fundraise for Mountain March but we've given some suggestions below to give you ideas. Download our fundraising pack at the bottom of the page and follow us on social media to join the march against cancer. There are plenty of hills and mountains just waiting to be walked up. So lace up those walking boots and head out into the fresh air for your Mountain March adventure! "Life is nor measured by the breaths we take, but rather by the moments that take our breath away"
Get a group together and climb a mountain or the equivalent height at your local climbing centre. Make sure your team have the necessary experience and training to do this safely! Join forces with your bike and take to the outdoors for some fast-paced fundraising. No bike? Don't let that stop you. Contact a local gym to see if you can use their exercise bikes. "You can't do anything about the length of your life, but you can do something about its width and depth"
All superheroes need a costume. Visit our shop to buy our standard CAC t-shirts or, if you're quick enough, a limited Mountain March 2019 edition. Ready to get started on your Mountain March? Download our fundraising pack for a handy checklist, more ideas to make your event a success, and details on how to donate any money raised. Make a difference today!